Palya! I write this update from the table of our camp kitchen in Coach Bay 3 of the Yulara Campground – music playing, a little team of legends preparing our lunch, crested pigeons grazing under our feet and punpunpa tjuta (too many flies!). We’re the slack or injured few who stayed behind while the rest of our WA pilgrims headed back into the National Park for the 10km Uluru Base Walk. We had such a special time visiting the Rock and the cultural centre yesterday and hearing the nursery-level versions of some of the most ancient stories this land and it’s people have to tell – we just had to go back for more! Friday afternoon and evening was spent at Yulara Oval with the pilgrims from other states, local families and some kids and young people from the Mutitjulu Community. This afternoon is all about rest and recuperation! 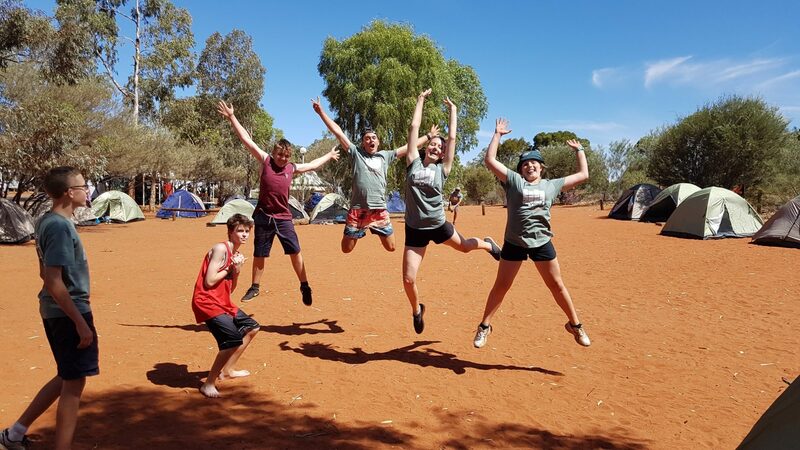 We’re looking forward to hitting up the pool, the Yulara shops and napping like we’ve never napped before so we’re fresh and ready for starting the 3rd stage of our journey – the trek home – bright and early tomorrow!